Rotterdam’s harbour basins and quays form an important historical reference for the port city’s heritage, with Wilheminapier firmly established as one of its most popular and spectacular areas. Since 2015, development partners BPD Bouwfonds Property Development, Ontwikkeling B.V. and SYNCHROON Ontwikkelaars in consultation with the municipality of Rotterdam, have been working on the development of residential buildings Philadelphia & Havana. MVRDV won the international architectural competition for the design of the last residential buildings on the south side of Wilhelminapier. 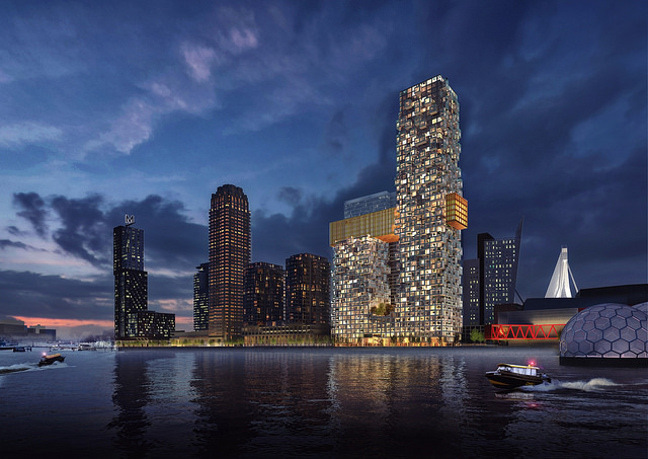 The Sax, with its two interconnected towers, will rise between the New Luxor Theater and the Boston & Seattle residential towers. The Sax is conceived as one recognisable silhouette with its main layout adopted for housing distribution in towers that are about 70 to 150 meters high and connected by an air bridge in which the 150 room hotel is located. Inside the building, all main rooms are situated within the bay-windowed facade meaning that all apartments benefit from the maximum amount of daylight enhanced by 270-degree panoramic views of the Nieuwe Maas and city. On top of the hotel at 80 meters high, there is a public terrace. The building combines residences, parking, a hotel, public viewing platform and importantly, a lively activated plinth with numerous commercial facilities including restaurants, shops, bars and cafes that bring diversity to the streets and quays. It reads like a vertical city but is also strongly rooted in contributing to the public life of the Kop van Zuid. 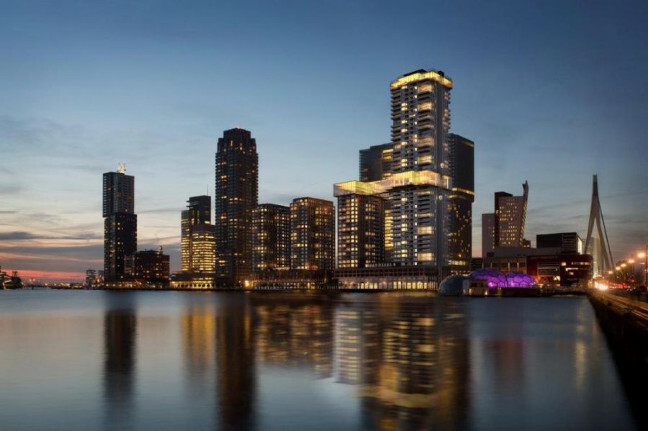 The scale and character of the developments of Wilhelminapier over the last decade have contributed to a recognisable city silhouette with an ensemble of towers populating the Kop van Zuid skyline. 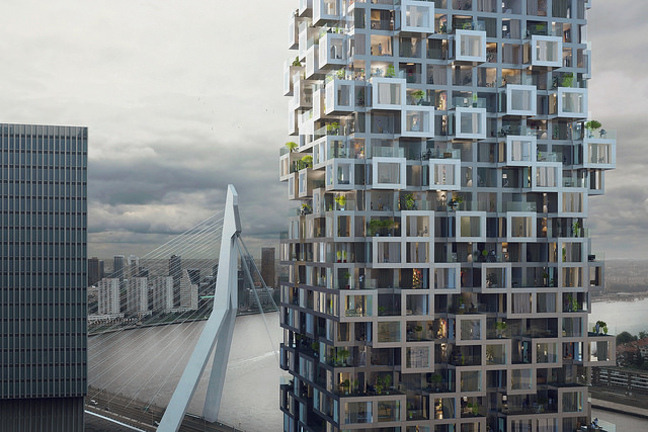 The Sax will be the latest addition to Rotterdam’s skyline thus contributing to the city’s now recognisable ‘Manhattan On the Maas.’ A residential building that is designed from the inside to the outside and therefore looks so distinctive, with no repetitive facades but a building with a diverse and more individual appearance. The Sax is a building designed in rhythm with the city. It represents musicality, character and elegance, but also variation and improvisation. 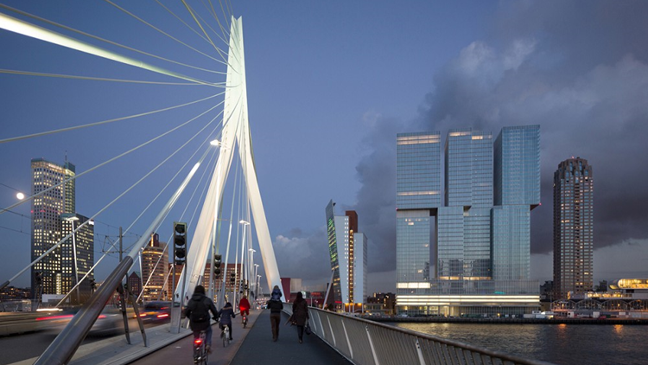 It also stands for the rough and unpolished; a raw tone; all metaphors echoing its historic port location from which a brand new building emerges as a new Soundwave for Rotterdam. 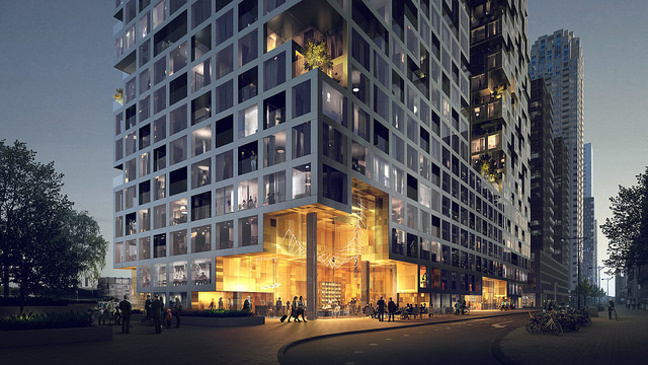 MVRDV worked together with ARUP on the structure, façade design and sustainability. Construction is set to being in 2018 and completion date by the end of 2022.